The U.S. Health Insurance Portability and Accountability Act (HIPAA), as amended, including Health Information Technology for Economic and Clinical Health (HITECH) Act, is a federal law that enables healthcare companies to incorporate technology into their businesses while ensuring data privacy and security. Kustomer is the next-generation customer management platform for the people-first enterprise. Leading brands choose the Kustomer platform because of the trust, reliability and flexibility it offers. We are committed to helping our customers deliver outstanding service and customer experiences, no matter what industry they’re in or types of products and services they provide. We’ve seen a growing demand for a secure and compliant cloud customer management solution where our customers could share and access protected health information (PHI). 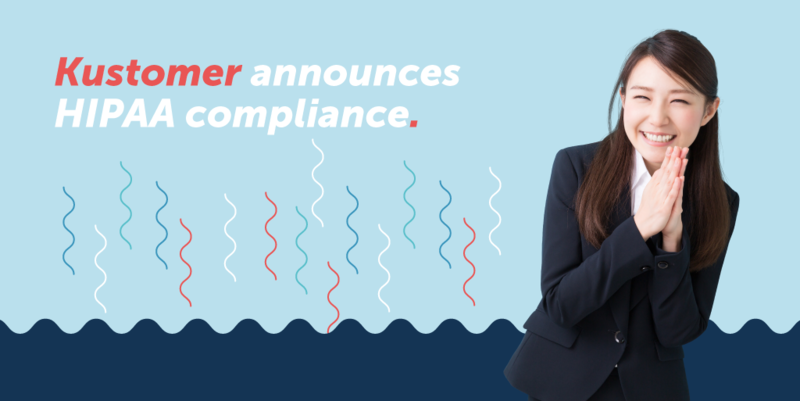 In 2018, we initiated a company wide HIPAA compliance program designed to extend the Kustomer platform and allow healthcare focused companies to use it. Today we’re excited to announce our alignment with The U.S. Health Insurance Portability and Accountability Act (HIPAA) through the offering of a business associate agreement (BAA). Kustomer helps customers fulfill their HIPAA obligations by providing these covered entities or business associates with appropriate security configuration options to help safeguard protected health information (PHI) which may exist within Service Data from misuse and wrongful disclosure. Now Enterprise customers across healthcare, pharmaceutical, and government industries can use Kustomer to securely share and access PHI while meeting HIPAA’s regulatory requirements. Kustomer does not collect or store PHI as part of normal business operations; however, any HIPAA-subject organization with a Kustomer Ultimate or Enterprise plan that works with PHI can enter into a BAA with Kustomer, in which both parties agree to fully comply with the requirements of the HIPAA rules. When will this capability be available? Ability to configure for HIPAA is available starting April 1, 2019. On what Kustomer plans is the capability available? Ability to configure HIPAA is available on the Kustomer Enterprise and Ultimate plans. We will release the full availability for Kustomer integrations on April 1, 2019. In the meantime, note that Kustomer integrations with Amazon Connect and Gmail will require the covered entity to sign separate BAAs with AWS and Google. Will I need to pay for this capability? Yes. There will be a $25 / month / seat charge for customers on the Kustomer Ultimate and Enterprise plans. Our team of account managers and CX specialists are available to provide you with more information and instructions on how to use the Kustomer platform while fulfilling HIPAA requirements. On April 1, 2019, we will release our HIPAA Implementation Guide. For more information about the Kustomer platform and how we help companies create Customer Friendships everyday go here or contact us.